Hunting readers, blog visitor a lot, what to say has become a trend among bloggers profesional. Many ways are chosen to pursue this mission, one of them with give comment. The blogging world seems incomplete and perfect if you do not give comment, like vegetables that lack of salt. Want to eat but it's tasteless for mercy, not in the meal, stomach feels hungry. This commenting activity is an important part of the SEO world. So important, then it is almost average in my observation, a website at the end of the article always attach form to make comments for readers or blog visitors. But unfortunately, there is also a website that does not at all give space to readers or blog visitor to comment. I do not know what kind of nutrients the website owner consumes so stingy provides space for commenting. Commenting is not only done through a network of blogs, but the fact is also done by readers through social media such as facebook, twitter. This is often done even if it is just to sharpen the lips on the sidelines of leisure time. But unfortunately give comments on social media that, in fact did not bring a back-effect for those who commented, most threat of thumb or sign like from other readers. There is no moderation at all from the owner of facebook account or twitter when there are visitors who comment. What happens then, everyone is free to issue his thoughts in any place without any fear of being hit by other account owners. In contrast to commenting on a blog or site, there is a beneficial side by giving this comment. If you say the model of cooperation, right fit. Between commented blogs and commenting blogs are equally profitable. Being a big question mark, what's the purpose of making that give comment? is not it just a waste of time. Wait a minute, do not quickly make that tilted conclusion. It's a misguided thought and must be quickly erased in the reader's memory. One of the goals of give comment is to leave a trail, this fits right. After knowing the eight points of purpose to give comment, then in truth from now you will not be stingy again to comment. So how to give comment that good? If you are careful and meticulous when blog walking or a walk to another blog, and will find many kinds of contents reader comments or blog visitor. Starting from random comments and sounds to comments that are weighted levels of blog visitor. But as far as I'm concerned, the majority of readers or blog visitor who commented it was very short and had a positive scent, such as a good article, thanks for the information, download permission, open practice license. There is no harm in giving comments like this, despite the impression that it appears that readers or blog visitor that actually do not read the contents of existing articles. He only wants his comments approved by the blog owner where he comments. Simple logic like this, when giving a brief and sharp comments of course according to the content of existing articles then if there is a reader, other blog visitor fad read your comments, maybe he will be impressed and think the author of this comment is a person who has intake of knowledge equivalent albert einstein. As a result, curiosity arises, and intend to try out the guesses momentarily splashed on the top of his head so he to think no harm in visiting the blog address of the author of the comment. See how the power of the comment proves to capture the attention of other readers and has a tremendous leverage effect in bringing the number of readers or blog visitors. 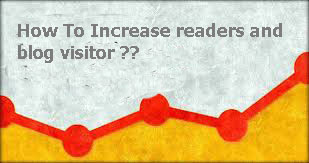 This is a quick method that can be relied upon to boost the number of readers, visitors to your blog. Not much different from writing an opinion article on your blog, write a comment need diction the right words, unique plus little reviews. Ideally the number of words when commenting is no more than 100 words. Try a sentence that is used far from the scientific impression, can provoke others big smile. Many readers give comment on a blog, the buffalo tub is stuck in its nose, the tone of the comment is flat and less dense. Well to steal the attention of the owner of a site or blog, try to give a slightly challenging comment, give a brief review where your disagreement from the contents of the article, of course complete with the reason. This comment model will give new inspiration to the owner so that as a reply your comment will be approved. This third point still I find, there are people who commented by joining the url link in the comment form. This is very unhealthy, and it is obvious that the motive of commenting just wants the site owner to know that he has been to the site. Avoid how to comment this model, I myself like to delete if there are poor comments such an idea. 4. Use the blog niche When arriving at the comment form fields section, usually available there 3 columns. "Name", "email address", "web address". When filling in the "name" column you should use niche blog instead of your name. Example if my blog is nichenya "partus". For the email address section, fill in your current email address, and for the web address of the content with the url of your site's article that is almost similar to the content with the articles you read. When the position of your article in the commentary, then any comments that come you must answer. This is a form of moral responsibility that you have dared to release an article. Back again at the beginning of this commentary as I have reviewed (point number 7) before, that to get approval from the owner of a blog or site, then it is better to comment for the purpose of asking. Maybe you really do not know something about the content of the article, or ask for a mere stale. But obviously if anyone asks, then the site owner will try to answer it. Providing comments is one of the entrance that can be utilized increase the number of readers, blog visitors. Not just backlinks that we can get, but there are 7 other points that wait for we can take. It will depend on our position as the owner or reader in giving comments. The structure of sentences is straightforward and interesting. Please comment contrary to article content. If you are obedient and worthy of these 7 points, I dare to guarantee 100 percent, the number of readers, visitors to your blog will be able to bolt fast.